After such a wet ride the day before, it was good to wake up to sunshine and dry roads. In fact, it was hotter than ever, predicted to reach 90 during the day. I prefer hot to cold, so not a problem. Sadly, my shoes didn’t fare so well in the wet. They’re old and are starting to come apart in the seams. At our first stop, I taped them together with Guerrilla tape. There! 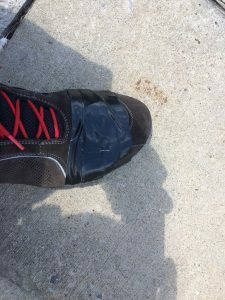 Permanently fixed! It was a hot day of riding and we quickly became exhausted, so we pulled into a hotel early. After dropping the luggage, we rode to the closest grocery store to get some food. 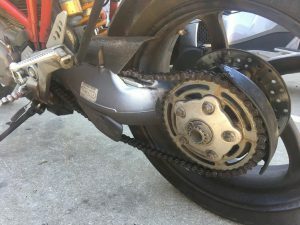 When coasting in first gear, I could hear an awful metal grinding noise coming from my bike. When starting the ride this morning, it felt like the bike slipped a little in first gear, so now I’m wondering if the gear box is done for. After inspecting the bike, I find that the chain is extremely loose. I spent the rest of the evening on Google.